The Lesina cantilever TV stand features a large safety glass base with a smaller glass shelf ideal for your set-top box, DVD player or games console. The rear column has holes for all your cables through to keep everything tidy. 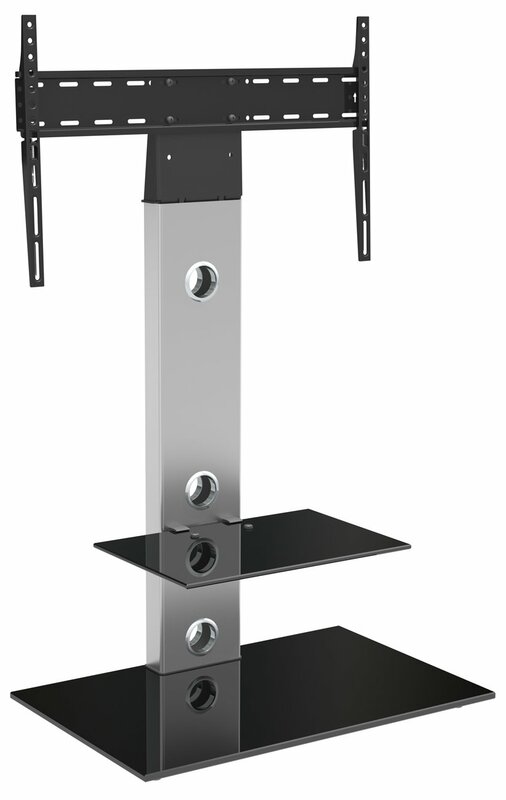 The fixed mounting bracket can support TVs from 32" to 55" that weigh no more than 40kg. Cable Management holes in the rear to keep everything tidy. Please note: Screens larger than 40" will overhang the stand at the sides, this is perfectly safe & normal. All measurements supplied are for overall sizes. Please check your product or contact us if unsure. 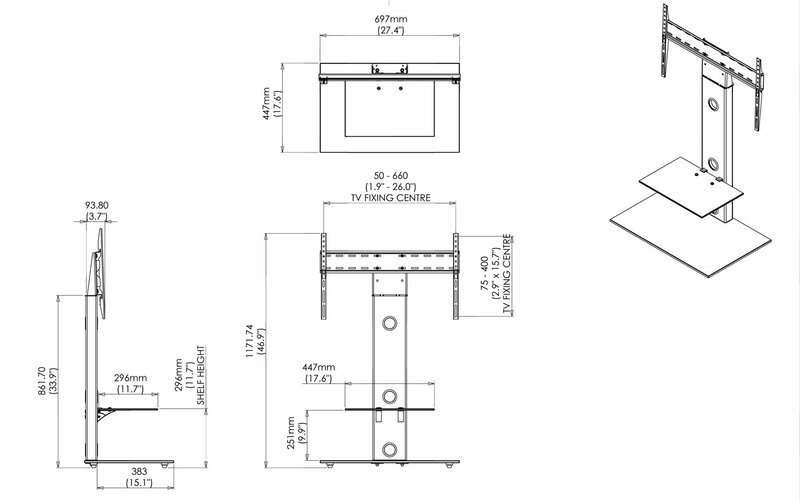 VESA Dimensions is the most important specification when considering a bracket for your TV. 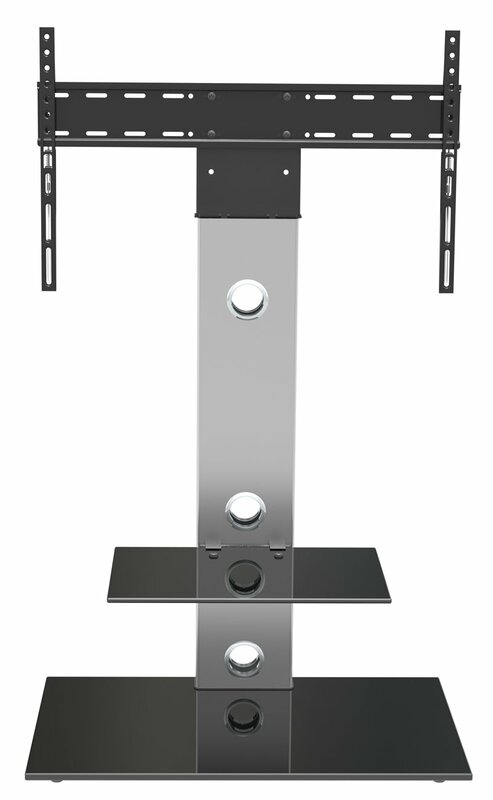 Please double check your TV is compatible with this bracket's maximum VESA (600mm x 400mm) by checking your TV's manual or by measuring the distance between the 4 holes on the rear of your TV. Looks good and easy to assemble. No clips to hide cables behind post. Could possibly fix a restraining strap from stand to the wall as a precaution. Absolutely as this is how my stand is arranged. Hi Jules, my TV has a 43 inch screen and the stand fits absolutely fine. There seems to be plenty of room for a larger screen. The base of the stand is very sturdy. Hope this helps. Hi - My TV is 49 inch Samsung curve - When I secure it to the frame I notice the top half of TV slightly leans back compared to the lower half of TV. Is this normal? Shouldn’t lean. I have a flat screen Samsung on mine and it’s fine. This sounds silly but have you put the brackets on correctly as I noticed I didn’t initially and it had a lean.